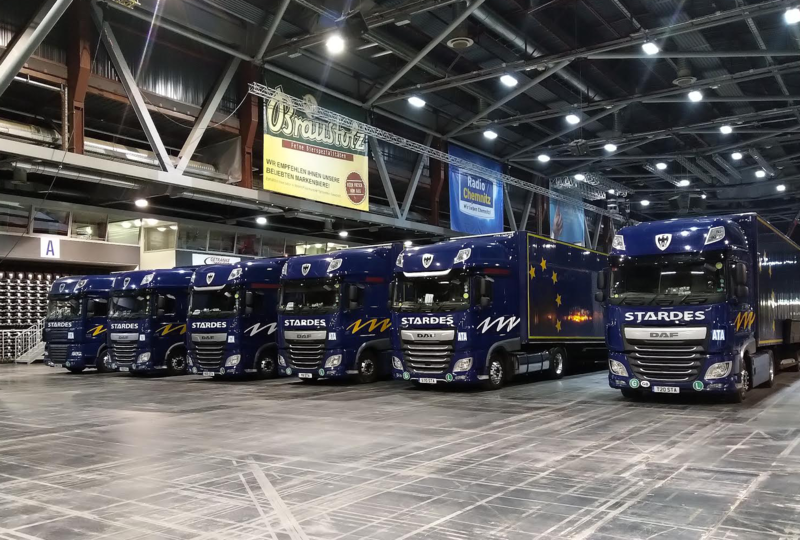 From small and nimble box vans to the largest articulated trailers in European entertainment logistics, Stardes have the ideal vehicle for your needs. Our fleet of trucks is constantly evolving and expanding to accomodate the needs of our clients. We have recently added our new Gray & Adams Mega Insulated Van, seen to the left in all its glory. Please do check back to see our latest additions to the fleet as we add new vehicles throughout the year. Our low-ride articulated trucks and trailers allow total flexibility by changing the design and size of the trailer being towed. The low-ride design offers greater internal capacity whilst remaining under the 4m overall height restriction imposed for international European transport. Our ongoing fleet replacement programme ensures our tractor units are the most up-to-date, cleanest and greenest trucks available. We then have them upgraded further with blind-spot cameras for enhanced safety, plus TV/DVD screens, fridges, and microwaves for driver comfort. We also fit mains hook up, this allows drivers to plug in at venues and use their equipment without having to run the engines; thus contributing to reduction of diesel emissions. All Stardes box trailers are insulated, to help protect valuable equipment from condensation, and each trailer comes complete with an externally stowed aluminium loading ramp, a comprehensive load securing system of straps and shoring beams and our own designed specification door locking bars and high security padlocks. 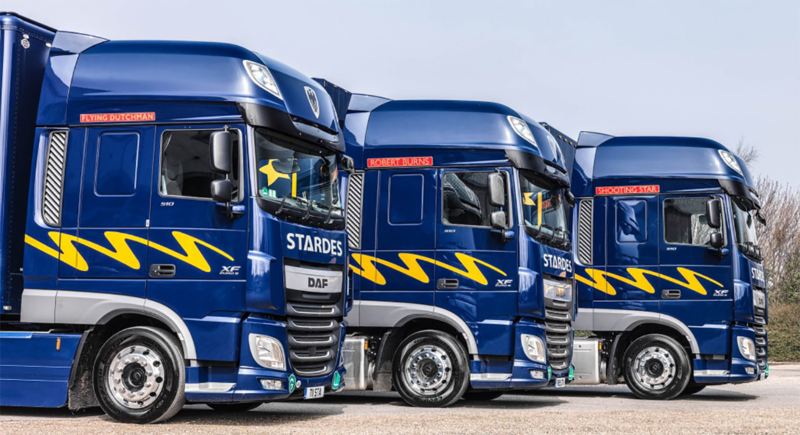 Stardes ‘Urban’ trailers are replacements for 18 & 26 tonne rigid trucks. Urban trailers are much shorter than standard trailers, meaning easier access to smaller venues, the trade off being their smaller size and reduced carrying capacity. Stardes Urban trailers measure 7.8m (25’6″) long, 2460mm (8’1″) wide by 2280mm (7’5″) high inside, they can carry loads weighing up to 10,000kg. All Stardes Urban trailers are equipped with large-platform tail lifts. Other trailer types, including conventional stepframe box, curtain-side and Euroliner trailers are available on request. Stardes low-ride flat-floor trailers are 13600mm (45′) long and offer an internal height of 2900mm (9’6″) and width 2460mm (8’1″), giving an internal capcity of 98m³. 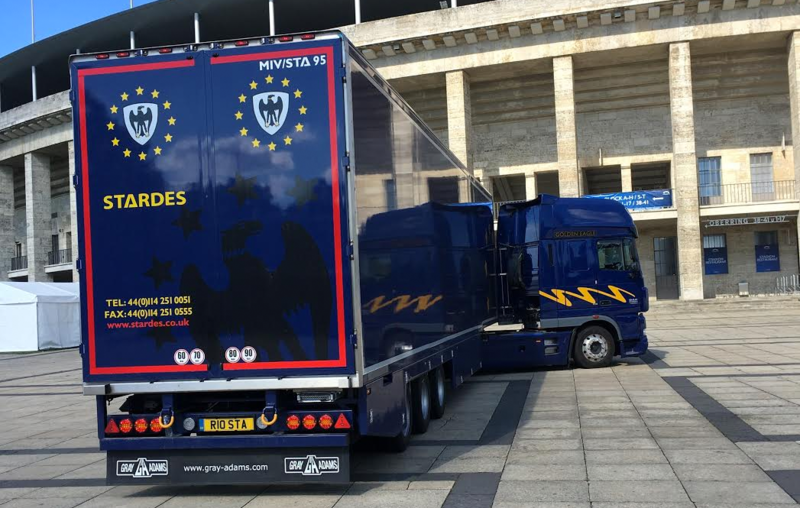 Stardes ‘MegaMax’ trailers are a 13600mm (45′) long low-ride stepframe trailer specifically developed for the entertainment industry. The internal width of 2460mm (8’1″) and height of 3070mm (10’1″) means these trailers allow 8’ riser boards to go side-by-side, and 3m trussing to stand on end. The internal capacity is a ‘true’ 101m³ – the largest possible for Pan-European road haulage.